Phew! It is HOTT with two T's out there and my poor oven is feeling awfully abandoned these days. But, who wants to turn on the oven when the A/C is running full blast and we are still sitting in a pool of our own sweat? My awesome neighbor recently had my husband and I over to their apartment for a "no cook" summer dinner with fresh veggies, fruits and charcuterie. She really inspired me to say goodbye to the oven for the last few blistering weeks of summer and embrace a fresh "no cook" style of eating for a little while. One of my favorite vegetables this time of year are radishes. I love the classic American round radishes and the French long and skinny ones alike. Serve this dish/ appetizer with a baguette and sea salt and encourage your guests to spread the dip on the bread, pile with radishes and sprinkle with a pinch of sea salt. Add a charcuterie plate and some fresh slices of cantelope and your "no cook" dinner is complete! 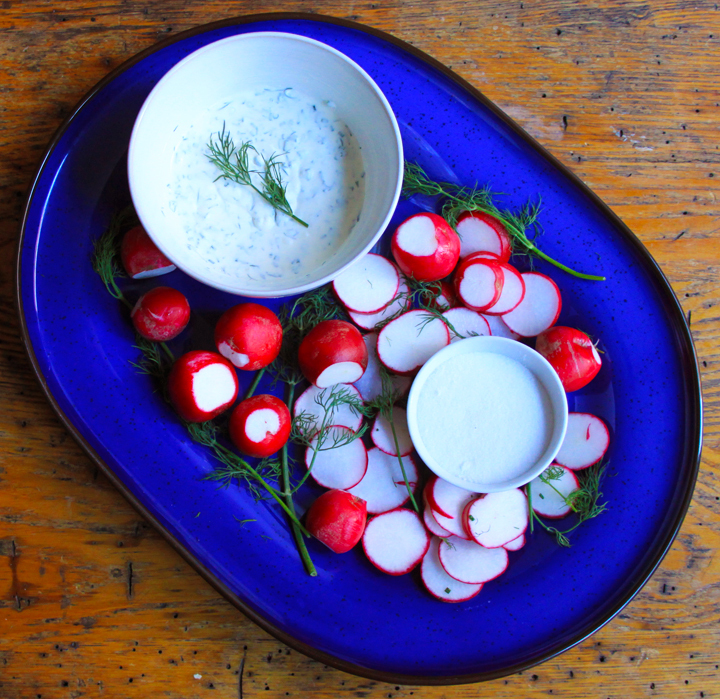 Mix the creme fraiche or sour cream with the chives, dill and garlic and serve with the sliced radishes, sliced baguette and a small bowl of sea salt.